Low-carb diets provide a way out of this nightmare cycle. Cutting refined sugar out of your diet for good is the only way to break the spell and get rid of the addiction for good. Unfortunately, the change won’t be instant. In the beginning, you are likely to experience major sugar cravings. They will stop once your body adapts to low-carb and sugar-free lifestyle. You really won’t care anymore! Here are some tips to help you fight sugar cravings – until you get to that low-carb nirvana stage of not needing it anymore. Use this Keto macros calculator to find out exactly how many grams of protein to have each day. The best thing about going low-carb is that you will naturally feel less hungry and eat less. Don’t try to deliberately skip meals or reduce calories on top of going low-carb. This can result in very strong cravings and lead you to fall off the wagon altogether! If you find yourself craving sugar often, trying eating more frequently. For example, have six small meals a day instead of three, or have a low-carb snack between meals. Regular frequent supply of food will make your body feel more “secure”, so that it doesn’t go into starvation mode and demand a sugar hit. Make sure to include some fat with each meal. Ideally, stay away from all processed foods. They are usually full of chemicals and empty calories. Whole foods are more nutritious, will leave you feeling satiated for longer and won’t cause sugar cravings. I know we all heard this one a thousand times, but it is even more crucial on a low-carb diet. Burning fat for fuel increases the amount of water your body needs, so make sure you stay constantly hydrated. Thirst can masquerade as sugar cravings. Certain supplements can help you fight sugar cravings. These include chromium picolinate, L-carnitine, omega oils and green tea extract. Nutri-Align Multivitamin for low-carb dieters contains extra-strong vitamins, chromium and green tea extract to help you fight sugar cravings. Artificial sweeteners are, well, artificial (and so is refined white sugar). Although they don’t have an immediate effect on your blood glucose levels, as real sugar would, they are still far from ideal. Many people report that sweeteners often make them crave the real thing. If this is the case, then it’s best to stay off. Having said that, some people find that a small helping of sweetener helps, so try it and see which way it works for you. Caffeine is known to influence blood sugar levels and can cause sugar cravings. If you are a coffee lover and constantly struggling with sugar cravings, reduce or eliminate caffeine and see if it helps. Not getting enough sleep will obviously make you tired, so your body might demand a quick energy fix in form of sugar. If you regularly miss out on sleep, you will find it difficult to control sugar cravings or to stick with your diet. There is no denying it, sugar foods are very attractive – cake shop display or sweets aisle in the supermarket can easily lure you in. Try to stay away from places and situations that would expose you to temptations. Don’t keep sugary foods in your house. It takes lot more willpower to control the craving for food when it’s right in front of you! This one may seem like a real cliché, we all know we are supposed to exercise anyway. I am including it on this list for one specific reason – exercise raises your serotonin levels, as does sugar. So exercising can help to fill the void directly. Intensive exercise like heavy weight lifting or HIIT is better for raising serotonin. From an early age, we get conditioned to think of sweet foods as “treats”. It can be difficult to break away from this reflex, but try to come up with something else instead. Perhaps there is a different non-sugary food you like. Maybe you can do something you enjoy instead of eating. Or buy a treat that you want that’s not food (music, gadgets, make-up, books – whatever rocks your boat). In addition to “treating” yourself with sweet foods, you might have some other emotional triggers for sugar consumption. It could be stress, anxiety, anger or shame. Start by identifying these triggers, and think of alternative ways to cope. Some people with severe emotional problems may need to address these underlying issues first, by working with a professional or using self-help resources. Always choose a specific diet plan and follow its guidelines precisely. Atkins, Dukan, Keto, South Beach – all these diets work – but only if you do. For example, one of my colleagues decided to “do low-carb”, so she stopped eating all carbs, but also stayed away from dietary fat and aimed for 1000 calories a day. How long do you think it lasted? About 48 hours. Diet plans are carefully calibrated – for example, on ketogenic diets like Atkins, you would be eating lots of fat to compensate for lack of carbs. Don’t re-invent the wheel! Hi I’m trying to lose weight and want a few hints and tips.on how to lose weight. I really could care less about SUGAR, but this latest try on the (Original) Atkins, I am seriously struggling. I ate cereal every day. Special K original. I realized that I miss the crunch of cereal and raw veggies, and I’m only on my 4th day. I’m so close to giving up cuz when I try stuffing myself with protien, I still want CRUNCH! Yes, I lived on straight up carbs and nearly no protien but this is REALLY HARD! Eating what you don’t want doesn’t help. I am so sorry to hear you are finding it difficult. Days 3-7 or so are definitely the hardest – you have now run out of stored glycogen and are beginning to transition. I hear you about the cereal! I used to miss crunchy foods too. Once you move on to Phase 2 of Atkins, you can make your own low-carb cereal with nuts, seeds and coconut flakes. It works just as well as the real thing! Atkins also do their own brand of cereal https://amzn.to/2HYEx6p But it’s not suitable for Atkins Induction, so please wait until that’s over. You mention that you are stuffing yourself with protein – that’s good – but what about fat? At this stage, I always recommend erring on the side of fat. Too much protein and not enough fat might keep you from switching to ketosis and make your cravings stronger. Eating what you don’t want doesn’t satisfy the cravings directly – I quite agree. But cravings might reduce if you make sure you are getting enough fat. Having said that, everyone is different. There are many reasons for strong food cravings – they could be physical, psychological, or just simply the result of our ingrained habits. I can only speculate based on the very limited info in your comment but please have a look at sections 2 (change in vitamins profile) and 3 (candida overgrowth). Perhaps some of this info will prove to be useful. Best of luck with your diet, and please don’t give up yet! If you can push through the next few days, it will get much easier. It’s so disheartening when I’m craving something like sweets so bad. Then I come to a site as helpful as this one but am tempted even more seeing the picture above of someone eating cupcakes lol. But that’s just my problem not yours. Thanks so much for this helpful site! Oh no! 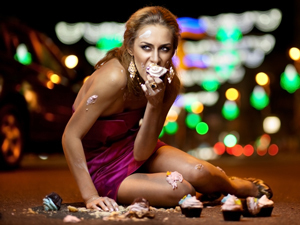 The photo was supposed to highlight the despair of sugar addiction, and inspire you to break away from it! You could top it with keto mousse to make a chocolate cupcake. 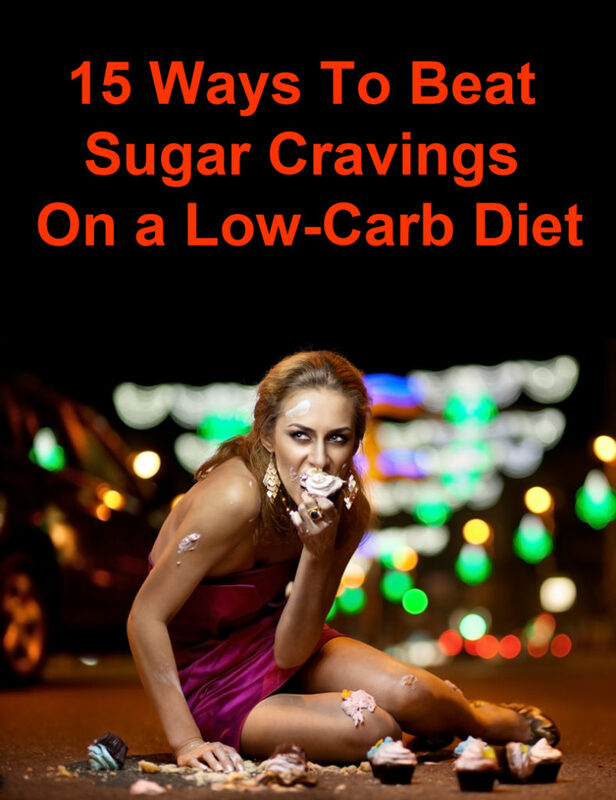 I really like your picture to illustrate sugar cravings. Could you tell me where does it come from ? I’d really like to use it for my own website, if I could buy it. Thanks for the link, it’s great !!! Tried Keto cold turkey many times but the carb cravings got the best of me. I am truly a carb addict. I would experience withdrawal with vomitting, shakes, and dizziness to the point I couldn’t function. This time before starting the Keto diet I eliminated all refined sugars and gluten but continued to eat potatoes, fruits and steel-cut oats for a month. Within 2 days my junk carb cravings disappeared. Now three days into Keto and all is good. No cravings, shakes or vomiting! Well done, that’s fantastic! Thank you for sharing your experience with us. Sugar free drinks, Strawberry yogurt (made in part with cream) and new I’m going to be trying the strawberry cheesecake diet on this site! Sounds good, I hope the cheesecake turns out well!